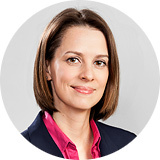 Margot Kastner studied trade economics at the University of Economics and specialised in trade & marketing, and behavioural scientific oriented management. She is currently working at Iventa in the division HR/Controlling – especially the combination of a propensity for numbers and orientation towards people still brings a smile to her face after more than 10 years with the firm. As part time employee, she likes to spend time with her family.